Vitamin D affects all systems in the body. Both 25 dihydroxy vitamin D [25(OH)2D] and its active hormonal form, 1,25-dihydroxyvitamin D [1,25(OH)2D; calcitriol] are essential for human physiological functions, including damping down inflammation  and the excessive intracellular oxidative stresses [2-4]. Vitamin D is a potent anti-oxidant that improves mitochondrial activity, preventing oxidative stress-related protein oxidation, lipid peroxidation, and DNA damage . Recent data support less known, key functions of vitamin D on non-musculoskeletal functions, particularly on mitochondrial respiratory functions/energy generation, oxidative stress, and the aging process [6, 7]. Calcitriol dampen inflammation, oxidative stress, cell/tissue damage, and thereby, the aging process. Hypovitaminosis D, on the other hand, accelerates these processes. Consequently, vitamin D deficiency increases the incidence and/or severity of many age-related metabolic disorders that are linked to oxidative stress and accelerates the aging process . Diseases that get worsen by vitamin D inadequacy include, insulin resistance, type 2 diabetes, obesity, hypertension, memory disorders, osteoporosis, certain cancers, and systemic inflammatory diseases, and pregnancy-associated complications . In addition to hypovitaminosis D, toxins, metabolic abnormalities, and the aging process itself causes mitochondrial dysfunction [10-14]. Abnormal mitochondria produce suboptimal amounts of ATP while generating excess ROS; a double whammy, creating a vicious cycle of enhancing the effects from excessive oxidative stress [13-15]. Moreover, in the presence of vitamin D deficiency, DNA damage, impair DNA repair systems, premature cell death, and accelerated aging get accelerated [12, 16]. Vitamin D deficiency causes mitochondrial dysfunction that is synergized by intracellular inflammation [17-20]. Adequately powered, properly designed randomized controlled clinical studies in subjects with vitamin D deficiency (i.e., serum 25(OH)D concentrations less than 20 ng/mL) using the nutrient vitamin D as the key intervention and predefined hard endpoints/primary outcomes are still lacking . Protective effects of vitamin D improves mitochondrial and endocrine functions, reducing the risks of autoimmunity, infections, metabolic derangements, and impairment of DNA repair. Whereas, deficiency worsen these and aids the aging process [22-24]. To generate adequate vitamin D in situ, one needs to have a healthy balance of sun exposure in favor of benefits while avoiding potential harmful effects [25-27]. 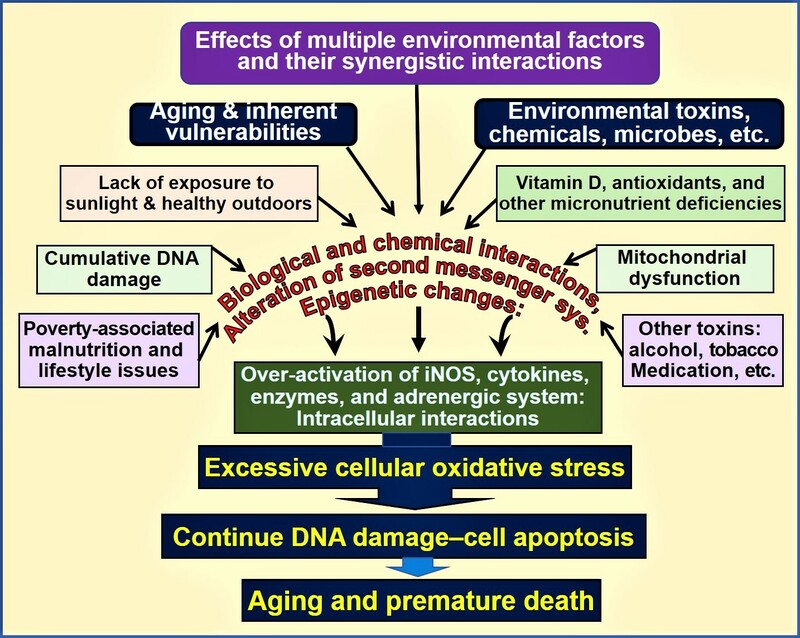 Advancing age promotes cellular accumulation of toxic products, particularly those related to oxidative stress such as methylation of DNA. In conjunction with mitochondrial dysfunction and reduced viability of cells, lead to premature cell deaths . It also reduces the immune functions, immune-senescence, together with inflammation, as demonstrable with increased circulating pro-inflammatory cytokines [29, 30]. Combination of these contribute to many age-related disorders, such as Alzheimer’s disease, cardiovascular and pulmonary diseases, and increased susceptibility to autoimmunity and infections [29, 30]. Vitamin D works in conjunction with micronutrients, vitamins and antioxidants. In the presence of physiological serum 25(OH)D concentration of between 30 and 60 ng/mL (75 and 150 nmol/L), metabolomics, transcriptomics, epigenetics effects of vitamin D  and suppression of oxidative stress and systemic inflammation, lead to improved clinical outcomes. The benefits derived from savings and reducing the risks of common diseases by increasing the population serum 25(OH)D concentrations beyond 30 ng/mL, are orders of magnitude higher that the vitamin D deficiency associated investigations and treatment costs. Thus, a country-wide replacement of vitamin D is a highly cost-effective public health approach that would lead to tangible positive impact on people and the economy. Figure 1. Environmental, microbial, biological and chemical interactions that modify DNA and mitochondrial functions and epigenetics, which modifies the aging process. Vitamin D deficiency is one of many factors that enhances this oxidative-stress cycle, accelerating premature cell death [abbreviations used: DNA = deoxyribonucleic acid; iNOS = inducible nitric oxide enzyme]. Normal serum concentrations of both 25(OH)D and 1,25(OH)2D are essential for optimal cellular function and protect from the excessive oxidative stress-related DNA damage. However, increased risk for illnesses and reduced longevity can occur despite the presence of physiologic concentrations of calcitriol because this is not the only mechanism protecting cells from oxidative stress. For reductions in the incidence of diseases, longer-term maintenance of a steady state of the serum 25(OH)D concentration is necessary . The minimal level is considered to be 30 ng/mL (50 nmol/L), while the optimal range is between 30 and 60 ng/mL . Wei, R. and S. Christakos, Mechanisms Underlying the Regulation of Innate and Adaptive Immunity by Vitamin D. Nutrients, 2015. 7(10): p. 8251-60. George, N., et al., Effect of vitamin D3 in reducing metabolic and oxidative stress in the liver of streptozotocin-induced diabetic rats. Br J Nutr, 2012. 108(8): p. 1410-8. Berridge, M.J., Vitamin D cell signalling in health and disease. Biochem Biophys Res Commun, 2015. 460(1): p. 53-71. Shelton, R.C., et al., Altered expression of genes involved in inflammation and apoptosis in frontal cortex in major depression. Mol Psychiatry, 2011. 16(7): p. 751-62. Ricca, C., et al., Vitamin D Receptor Is Necessary for Mitochondrial Function and Cell Health. Int J Mol Sci, 2018. 19(6). Holmes, S., et al., Oxidative stress defines the neuroprotective or neurotoxic properties of androgens in immortalized female rat dopaminergic neuronal cells. Endocrinology, 2013. 154(11): p. 4281-92. Petersen, K.S. and C. Smith, Ageing-Associated Oxidative Stress and Inflammation Are Alleviated by Products from Grapes. Oxid Med Cell Longev, 2016. 2016: p. 6236309.
da Luz Dias, R., et al., Leucine reduces the proliferation of MC3T3-E1 cells through DNA damage and cell senescence. Toxicol In Vitro, 2018. 48: p. 1-10. Yin, F., et al., Energy metabolism and inflammation in brain aging and Alzheimer's disease. Free Radic Biol Med, 2016. 100: p. 108-122. Yin, F., et al., Mitochondrial function in ageing: coordination with signalling and transcriptional pathways. J Physiol, 2016. 594(8): p. 2025-42. Lin, M.T. and M.F. Beal, Mitochondrial dysfunction and oxidative stress in neurodegenerative diseases. Nature, 2006. 443(7113): p. 787-95. Petrosillo, G., et al., Mitochondrial dysfunction in rat brain with aging Involvement of complex I, reactive oxygen species and cardiolipin. Neurochem Int, 2008. 53(5): p. 126-31. Petrosillo, G., et al., Mitochondrial complex I dysfunction in rat heart with aging: critical role of reactive oxygen species and cardiolipin. Free Radic Biol Med, 2009. 46(1): p. 88-94. Marzetti, E., et al., Mitochondrial dysfunction and sarcopenia of aging: from signaling pathways to clinical trials. Int J Biochem Cell Biol, 2013. 45(10): p. 2288-301. Berridge, M.J., Vitamin D deficiency: infertility and neurodevelopmental diseases (attention deficit hyperactivity disorder, autism, and schizophrenia). Am J Physiol Cell Physiol, 2018. 314(2): p. C135-C151. Calton, E.K., et al., Prevailing vitamin D status influences mitochondrial and glycolytic bioenergetics in peripheral blood mononuclear cells obtained from adults. Redox Biol, 2016. 10: p. 243-250. Morris, G. and M. Berk, The many roads to mitochondrial dysfunction in neuroimmune and neuropsychiatric disorders. BMC Med, 2015. 13: p. 68. Cevenini, E., et al., Age-related inflammation: the contribution of different organs, tissues and systems. How to face it for therapeutic approaches. Curr Pharm Des, 2010. 16(6): p. 609-18. Morris, G. and M. Maes, Mitochondrial dysfunctions in myalgic encephalomyelitis/chronic fatigue syndrome explained by activated immuno-inflammatory, oxidative and nitrosative stress pathways. Metab Brain Dis., 2014. 29. Grant, W.B., et al., Why vitamin D clinical trials should be based on 25-hydroxyvitamin D concentrations. J Steroid Biochem Mol Biol, 2018. 177: p. 266-269. Petersen, O.H. and A. Verkhratsky, Calcium and ATP control multiple vital functions. Philos Trans R Soc Lond B Biol Sci, 2016. 371(1700). Petrosillo, G., et al., In vivo hyperoxic preconditioning protects against rat-heart ischemia/reperfusion injury by inhibiting mitochondrial permeability transition pore opening and cytochrome c release. Free Radic Biol Med, 2011. 50(3): p. 477-83. Ureshino, R.P., et al., Calcium signaling alterations, oxidative stress, and autophagy in aging. Antioxid Redox Signal, 2014. 21(1): p. 123-37. Omura, Y., Clinical Significance of Human Papillomavirus Type 16 for Breast Cancer & Adenocarcinomas of Various Internal Organs and Alzheimer's Brain with Increased beta-amyloid (1-42); Combined Use of Optimal Doses of Vitamin D3 and Taurine 3 times/day Has Significant Beneficial Effects of Anti-Cancer, Anti-Ischemic Heart, and Memory & Other Brain Problems By Significant Urinary Excretion of Viruses, Bacteria, and Toxic Metals & Substances. Acupunct Electrother Res, 2016. 41(2): p. 127-134. Gilad, L.A., et al., Regulation of vitamin D receptor expression via estrogen-induced activation of the ERK 1/2 signaling pathway in colon and breast cancer cells. J Endocrinol, 2005. 185(3): p. 577-92. Robsahm, T.E., et al., Vitamin D3 from sunlight may improve the prognosis of breast-, colon- and prostate cancer (Norway). Cancer Causes Control, 2004. 15(2): p. 149-58. Jallali, N., et al., Vulnerability to ROS-induced cell death in ageing articular cartilage: the role of antioxidant enzyme activity. Osteoarthritis Cartilage, 2005. 13(7): p. 614-22. Fulop, T., et al., Immunosenescence and Inflamm-Aging As Two Sides of the Same Coin: Friends or Foes? Front Immunol, 2017. 8: p. 1960. Franceschi, C., et al., Inflamm-aging. An evolutionary perspective on immunosenescence. Ann N Y Acad Sci, 2000. 908: p. 244-54. Mark, K.A., et al., Vitamin D Promotes Protein Homeostasis and Longevity via the Stress Response Pathway Genes skn-1, ire-1, and xbp-1. Cell Rep, 2016. 17(5): p. 1227-1237. Hollis, B.W. and C.L. Wagner, Clinical review: The role of the parent compound vitamin D with respect to metabolism and function: Why clinical dose intervals can affect clinical outcomes. J Clin Endocrinol Metab, 2013. 98(12): p. 4619-28. Wimalawansa, S.J., Non-musculoskeletal benefits of vitamin D. J Steroid Biochem Mol Biol, 2018. 175: p. 60-81.